Have a question for Hesperia Barri Gotic? "Very friendly and gracious staff!" 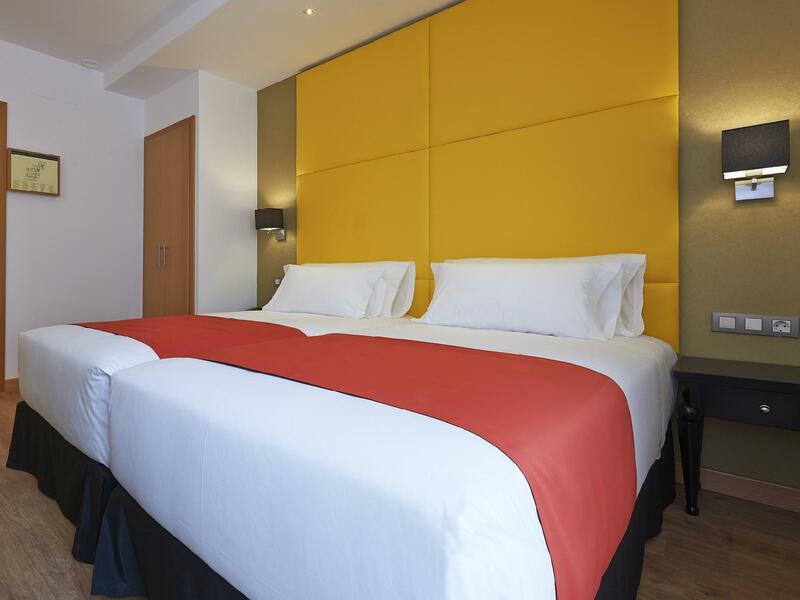 "The hotel's location is outstanding, my room was modern & immaculate and the staff was cheerful and helpful." "There is a generous supply of Toiletries and a great shower ." "Our room was quiet & comfortable." 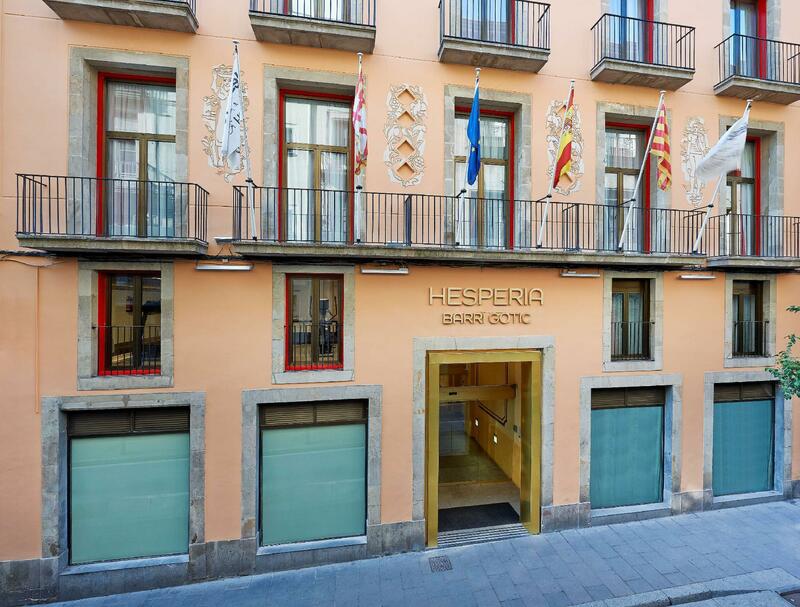 Hesperia Barri Gotic is completely renovated and has a great location in Barcelona’s Gothic Quarter. It’s an attractive 19th century building, a short walk from the historic old town, the harbor, and the beach. The hotel provides modern accommodation and friendly service at an affordable price. It is close to the famous Las Ramblas and other popular sights and attractions such as entertainment and night club areas. The property can be reached easily on foot or by metro. 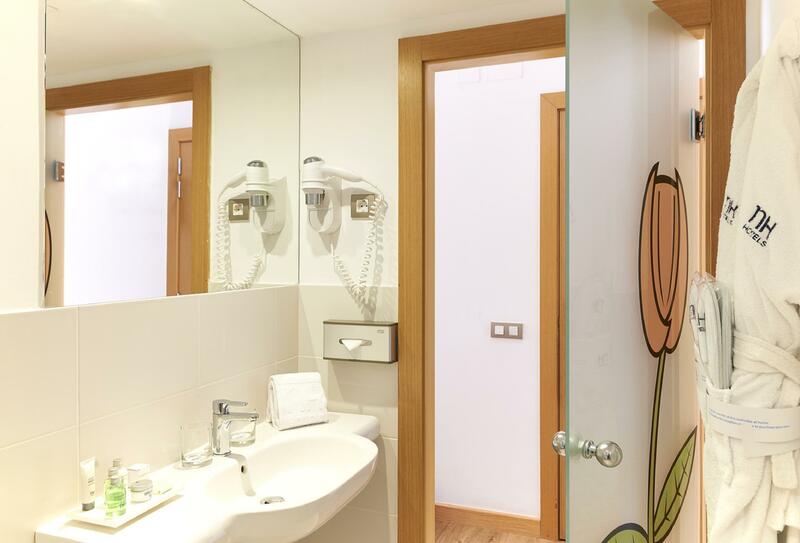 There are 71 rooms in Hesperia Barri Gotic, decorated in a vivid color scheme and comfortably furnished with modern conveniences such as air conditioning - essential in the Barcelona summers - and cable TVs. An excellent buffet breakfast is served daily, and guests can taste traditional Catalan and international dishes at the restaurant. "Would definitely come back and stay here again!" The hotel exceeded the expectations. The location was amazing and accessible to all points of attractions. Although it is very near to touristic places, it was very calm and quiet. The rooms were bery clean and neat. Staff were very helpful. Recommended. I would stay there again when I visit Barcelona again. Nice staff and great location. At times a bit noisy facing rooms to the street Ampel. But staff and facilities made up for it. We liked it there. The location is perfect if you’re looking for something central the beach, wonderful off-the-beaten path restaurants, artsy/shopping district and touristy area while being a little bit away from the crowds. Plus the neighborhood has plenty of options for exploring on foot, via hop on/off (Columbus Monument) and Metro (Jaume I was my stop of choice and probably the closest/easiest to get to). If you want to feel like a local but with the luxury of hotel amenities, this is the place. Would definitely come back and stay here again! Great hotel and amenities! Very friendly and gracious staff! Perfect location! We had a very good 3 night stay here last week for our first visit to Barcelona . Staff are friendly and helpful , especially Souhail who greeted us warmly on arrival and announced that there was a 'surprise ' in our room which was 2 pieces of cake - that was a nice touch ! Our room was on the fourth floor and was a decent size , there was 2 single beds put together instead of a double bed but we didn't mind . There is a generous supply of Toiletries and a great shower . As expected from a hotel in a popular city there was some noise from people on the street below but we prepared for this and used our ear plugs and slept well ! Breakfast is not cheap at 16 euro per head but it is a generous, varied and delicious spread with a staff member constantly replenishing Any empty plates . The hotel is in a great location in the lovely gothic quarter - if you are a fan of history and architecture you'll love this area and it is also about 15minute walk from La Rambla and the beach. Location and breakfast are very good. Besides that, I found it quite expensive for what you get. Hotel prices may be high in Barcelona, but some things could still really be better. There is a nasty sewage smell in the lobby and elevator. Bathroom door is made of glass and doesn't close properly, giving some issues with privacy. Bed was too hard for my liking. Towels were changed daily eventhough we hung them as to not be washed like the sign said (for the environment). Staff tried to sell us an upgrade upon check-in for €25 a night after we had paid in advance, which I thought was not at all classy. It gave me the feeling I was missing out on a bunch of things while they could have just given us a free upgrade like many hotels in this price range do. Instead, they'd rather leave the room empty if not making a little extra money. In retrospect, I would have rather paid more elsewhere for more luxury and service as this didn't feel like value for (still a lot of) money. Great location in gothic quarter and great value for money in the city. Located in the atmospheric Gothic area surrounded by restaurants, cafes & shops. Our room was quiet & comfortable. Breakfast available but plenty of alternatives in surrounding area. Loved my stay! The hotel's location is outstanding, my room was modern & immaculate and the staff was cheerful and helpful. A great place! The staff were very helpful and friendly nothing too much trouble. The receptionist told us the breakfast times but did not mention the added cost. After a few days I asked her about this and she said it was impossible for her to have forgotten to mention the hefty prices for such a poor breakfast. The place is in an alley and its an unsavoury neighbourhood. Avoid this place unless you have nowhere else to go! I would have to say it is the smallest room I have ever stayed at. Also what is with the bed it is so hard it makes concrete inviting. I was told they are new beds, maybe spend some money on better bedding rather than finding mattresses no other hotel would want. The hotel location is perfect. 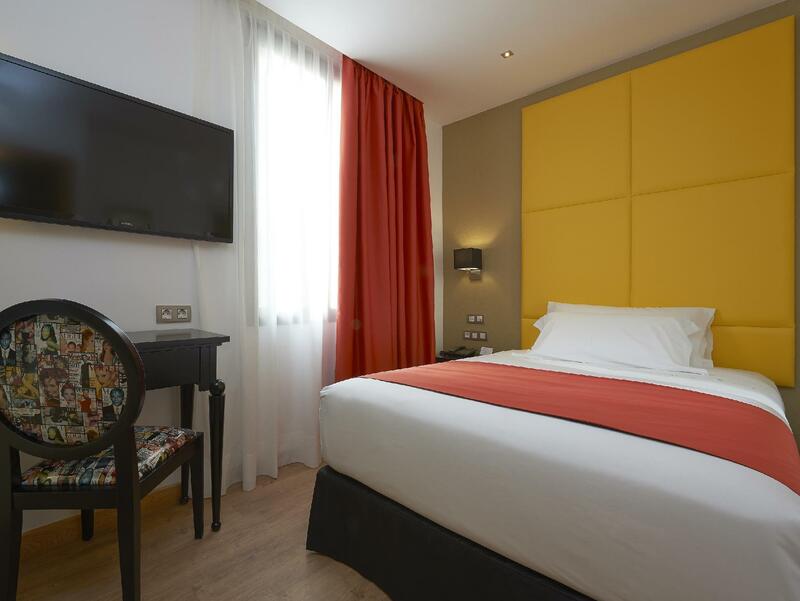 I went to Barcelona with a baby to do a little bit of tourism and this hotel is located close to the Harbour, beach, Ramblas and the old quarter. Also it's fairly easy to get to a Metro station and to the main market "Mercado de la Boqueria". At the hotel, they offered breakfast for 14euros or 9euros if booked the day before. Instead I went to have breakfast in 2 coffee shops with abbundance of sandwiches and pastries to chose from and had breakfast for less than 5 euros. The hotel is quite clean and the staff very friendly. The only dissapointment was that they didn't have kettles available and I had to go downstairs to reception to get boiling water every time I needed to prepare the milk for my baby. It was excellent. I have already recommended the hotel to my Facebook friends and will be doing a very good review on trip advisor when we get home.